Was sent the following pup pictures over the last week. They sincerely did cheer me up. Hope they brighten your day too. Lovely to see Sinbad there amongst the other pups (black lab, bottom left!). He sends an appreciative lick. Thanks for more great pictures! Pets are a such a comfort to us all and I’m wishing you comfort too! Thanks for posting the picture of Angus, my Yellow Lab. He’s honored to be in such great company! Hi Wendy, Thanks for posting pics of my LuLu(Marco’s “secret twin”, the Cocker Spaniel!) She sends you kisses all the way from Las Vegas! Glad to see some kitties made it. LOL! I almost sent a snap of my Gracie. What an honor for them to be there amongst all the dogs! Love dogs too!! Great to see Bobbie in the mix – cheers! Just after I took that, he snuck over to me and slapped a dirty great lick onto the camera lens. I think it was his way of saying let me lie! 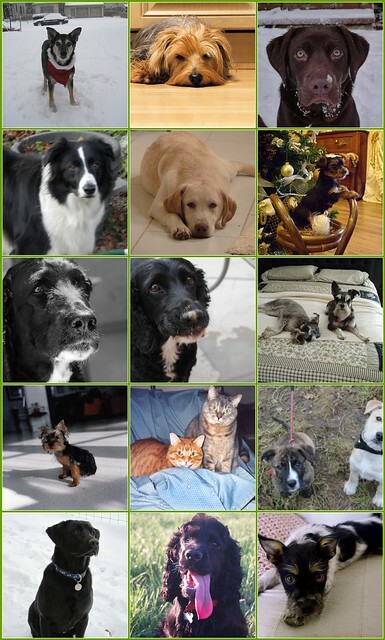 Delta and Spock, 2nd bottom right hand side, want to say ‘hello’ to all the other doggies – and the cats as well – out there in cyberspace blogland. I hope that these photos might make your Mum feel better. Please give her our love. Marco’s tongue should perhaps be in The Guiness Book Of Records ? My Pinito is the last one. The one with the bushy eyebrows and the innocent look. Thank you so much, Wendy, and tons of good wishes from the Canary Islands. Wendy, thanks for adding my fur babes (kitties with personality ++). Hope they gave you and your mum a smile for the day! that is such a cute photoboard of fluffy faces – couldn’t help but cheer up anyone – and I was pleased to see a couple of kitties in there as well as lots of puppies! cuteness galore is ALWAYS appreciated!